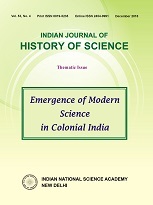 Published under the guidance of Indian National Commission for History of Science set up by the Academy since more than four decades now. The journal was first published in 1966 bianually. The articles started pouring in as the field got momentum and a lot of interest developed among the researchers working in various field of ancient, medieval and modern science in historical perspectives. It became an interesting forum for scientists, historians, sociologists, and philosophers for exchange of ideas on the evolution and characteristics of scientific concepts and technological advances. With increasing inflow of articles, the journal was made quarterly in 1984 and is being published in March, June, September, December every year. Besides research articles, the journal also publishes reports of relevant interest, book reviews, the supplements and important news articles as well.